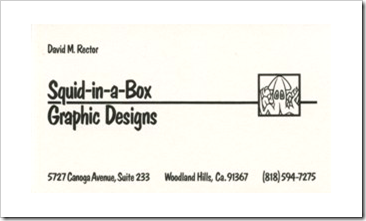 I have worked on various art projects over the years. This is a collection of some of those projects. 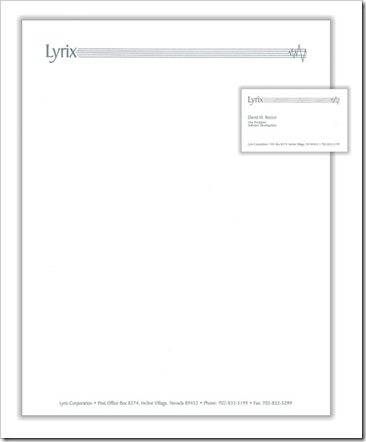 Links are provided when more details or alternate views are available. 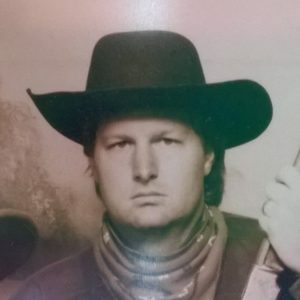 Computer programming projects can be found here. The second in a series of machines designed to lift a ball to the top of a track. The track is minimal, making the lifting mechanism the focus of the sculpture. 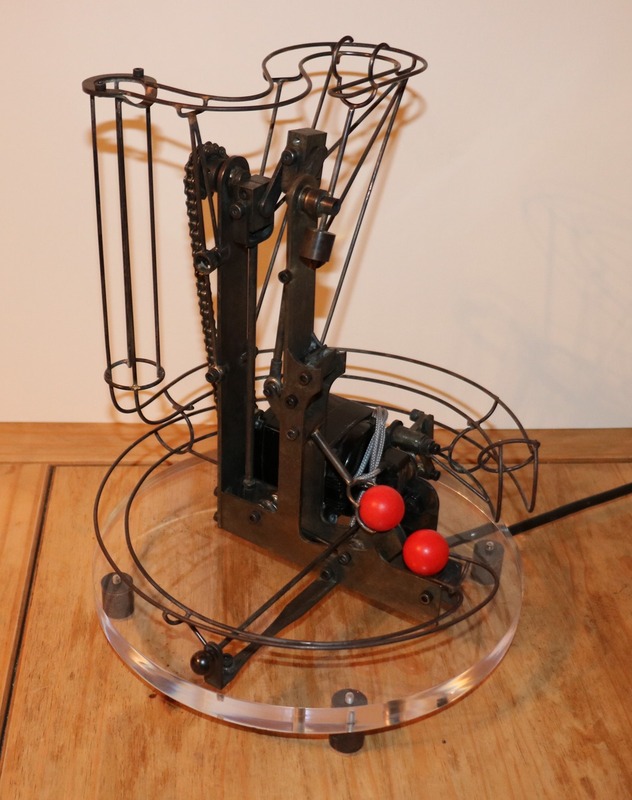 This machine uses three lifts; one lifts the ball into the path of the nest oscillating lift arm and the third lift rotates like the hands of a clock, picking up the ball from a middle location and dropping it on the track at the top. 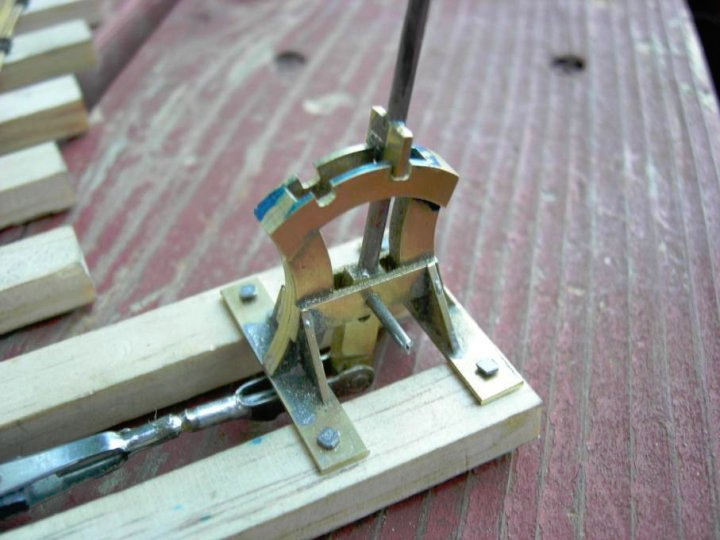 This machine was designed with the Linkage program. 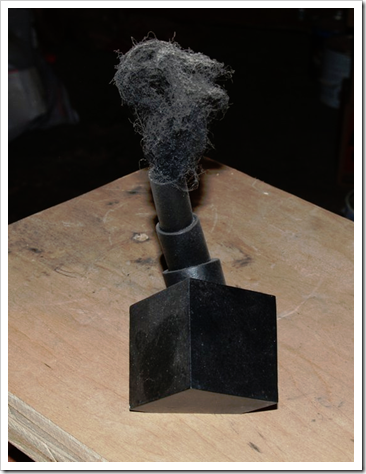 More information can be found in this blog post and some others that were written during the design and construction processes. 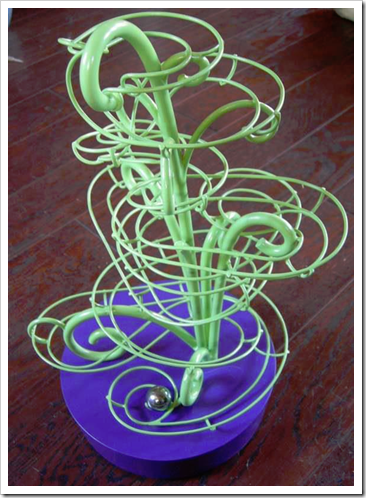 This rolling ball sculpture was the result of an effort to use the Linkage program to design a ball lifting mechanism, and then to build an RBS track to work with it. The minimalist track was designed to get the ball to the bottom without hiding or distracting from the lifting mechanism. 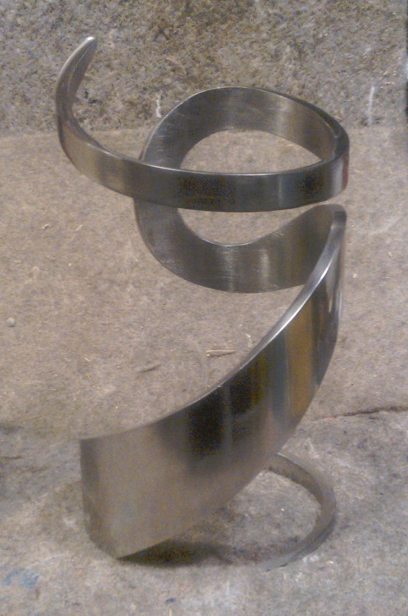 TMCC Welding for Art class project. 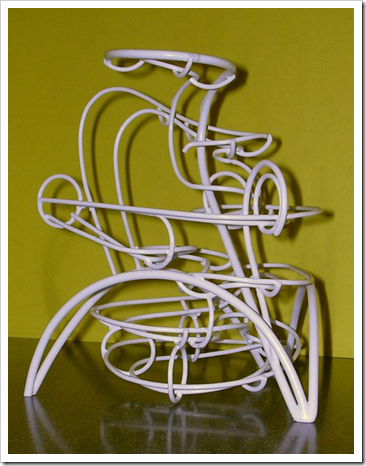 This sculpture was created as part of a class project to make a sculpture as if it were a commissioned piece for a blind person. 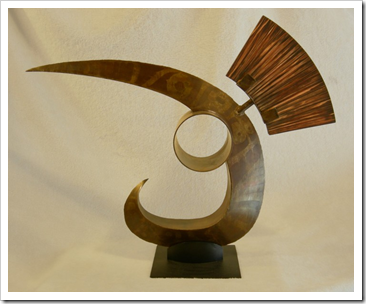 This sculpture is made from 16ga steel. 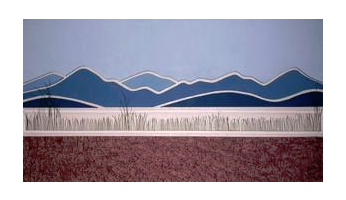 The design inspiration came from Native American art and is a similar style to the previous two class projects. The sheet metal was cut with electric sheers and rolled into shape. 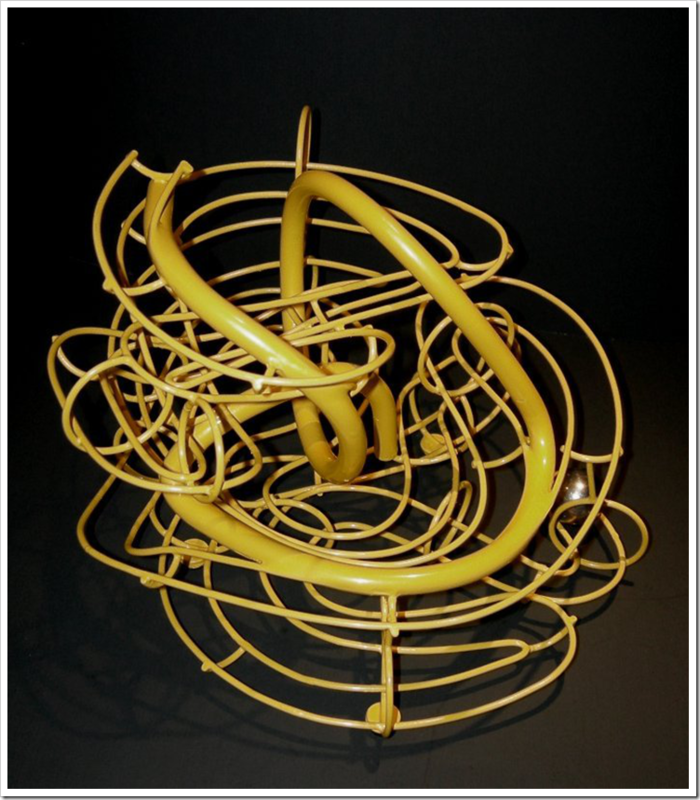 The large tube was formed with multiple layers of 16ga material while the smaller tube is a simple piece of pipe. 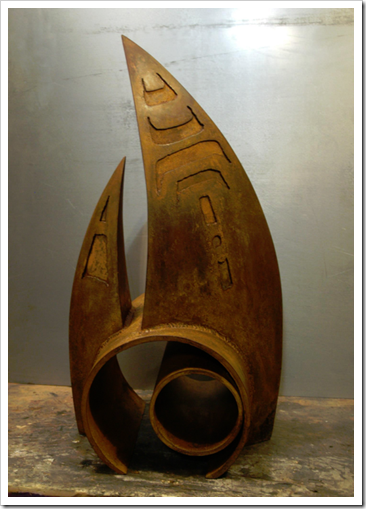 This small sculpture was cut from a piece of pipe using a plasma cutter. 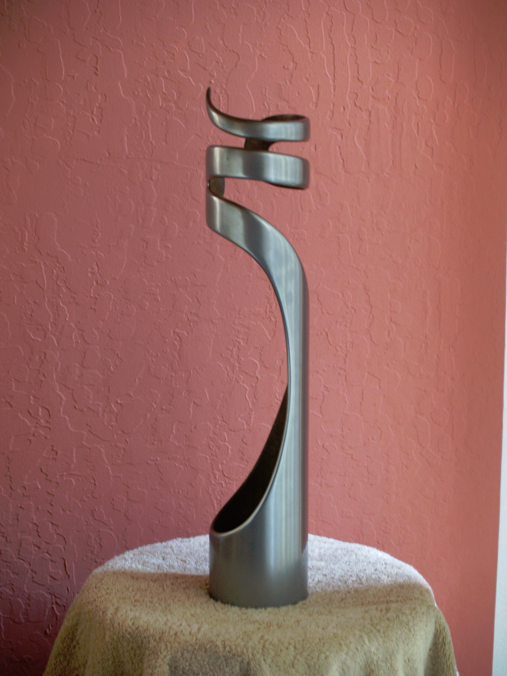 Large amounts of grinding helped define the final shape and many hours of polishing followed. 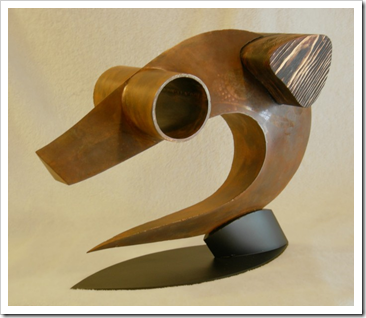 The pipe was part of a large satellite dish installation and is mild steel. 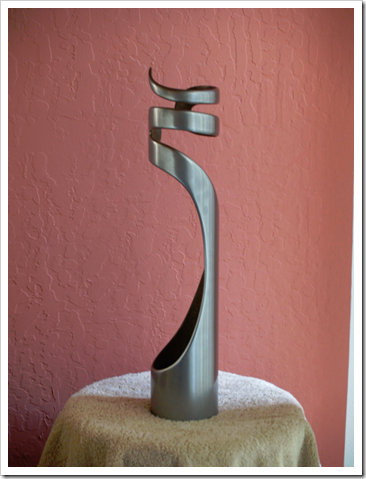 Click here to see a video of this sculpture working. 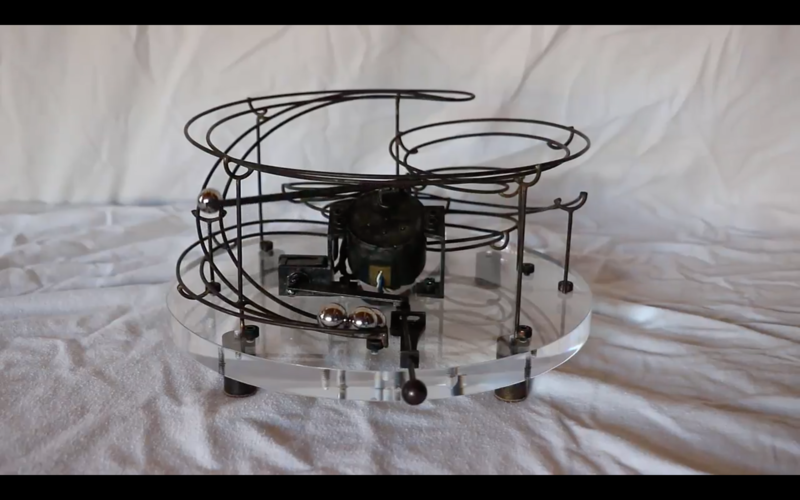 The only moving part to this kinetic sculpture is the 1 inch steel ball. 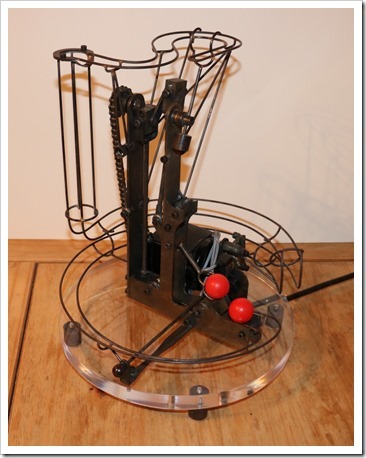 This RBS has a reversing mechanism that uses the balls momentum to make it smoothly transition from one track to another, while gravity and the slow moving ball make it take a different path after it reverses. 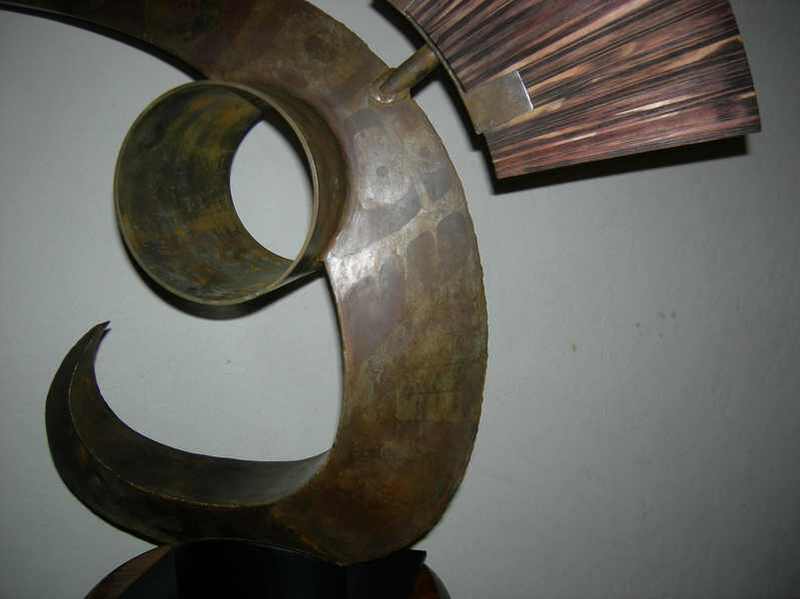 This TMCC Welding for Art class project was the second of this style and features welded steel and wood. 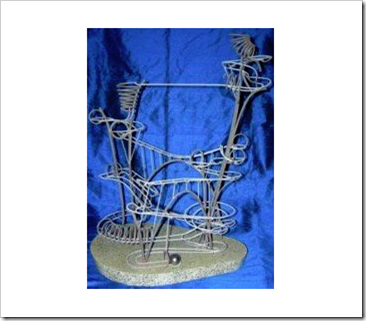 This is a hybrid piece that could be considered abstract or possibly impressionistic. A badger was the inspiration while abstract ideas from an earlier piece were carried over to make this look like the second in the series. The entire sculpture is 16ga steel. 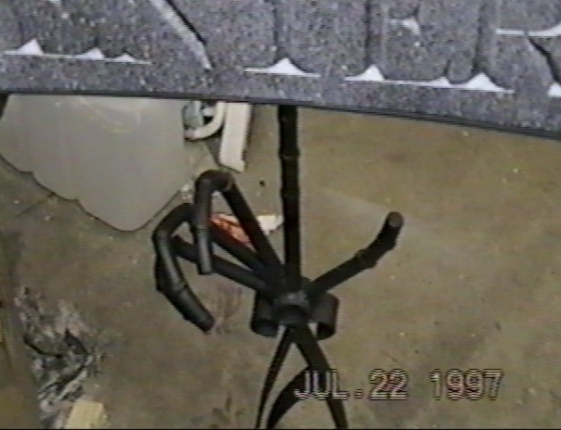 This was welded using an Oxygen-Acetylene torch except for portions of the base which were was done with a MIG welder. 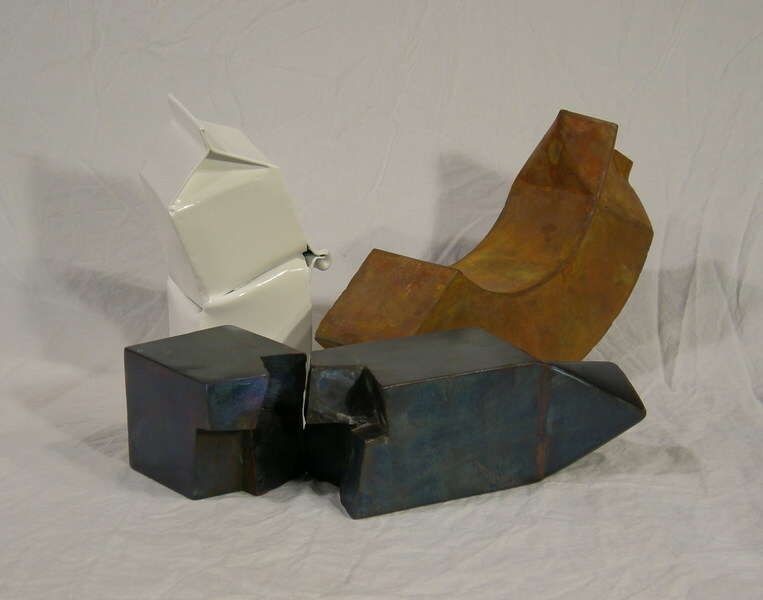 This TMCC Welding for Art class project was the first sculpture completed at the college. This piece is more of an impressionist work than abstract or representational. 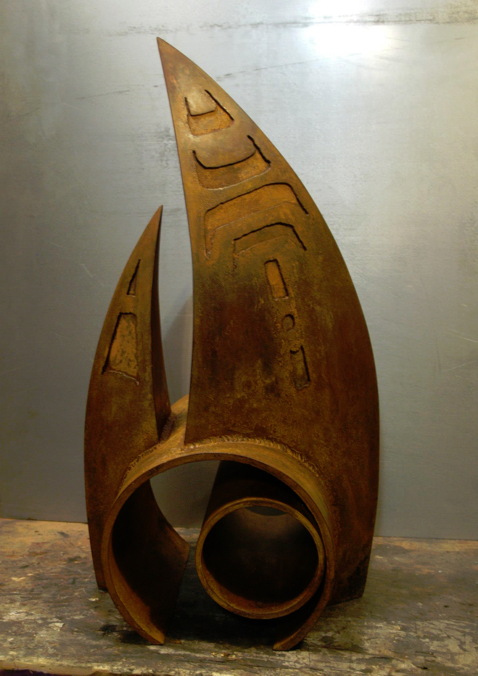 This was welded using an Oxygen-Acetylene torch except for portions of the base which were was done with a MIG welder. 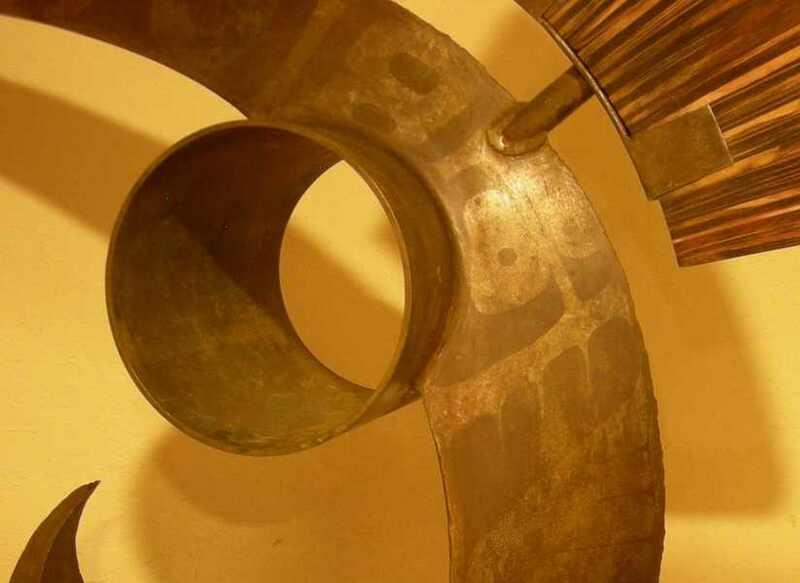 Patterns, as seen here, were sand-blasted in the steel and then made to rust with the rest of the piece. 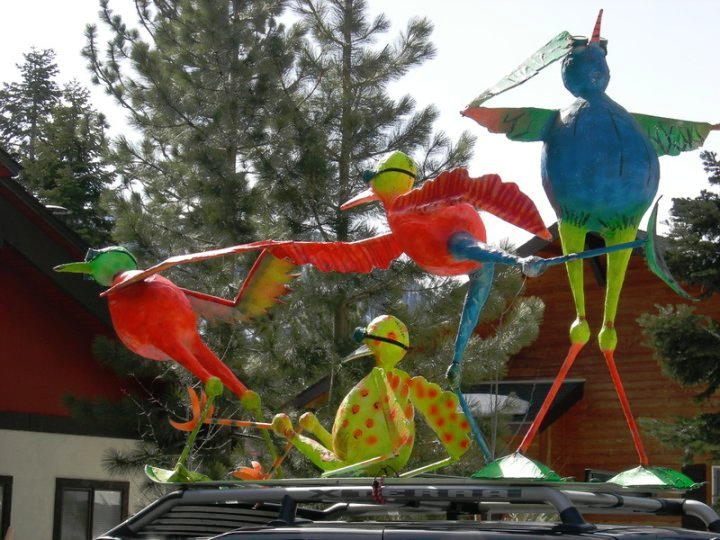 This “Dummy” for the Dummy Downhill race at Diamond Peak Ski Resort in Incline Village NV, was built using inflexible conduit covered by other steel strapping and reinforcements, window screen, expanding foam, and finally paper-mâché. The idea of four birds trying to look like one larger bird may have been lost on many of the viewers. 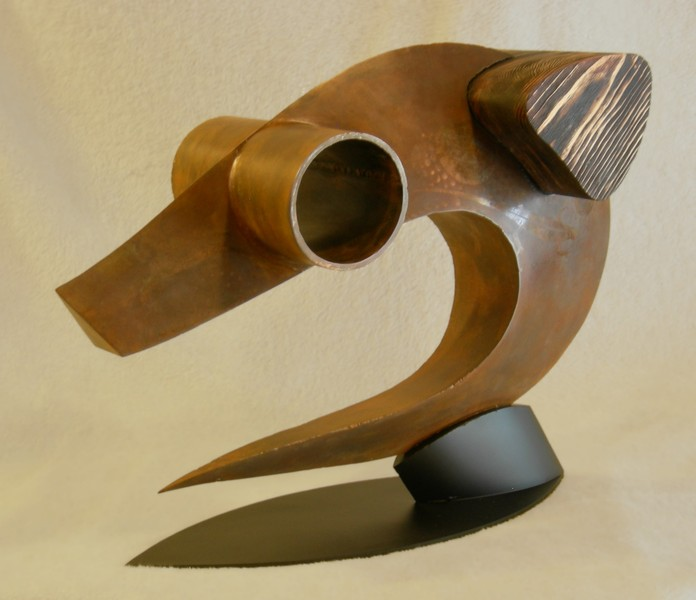 This sculpture was cut from a piece of pipe using a plasma cutter. 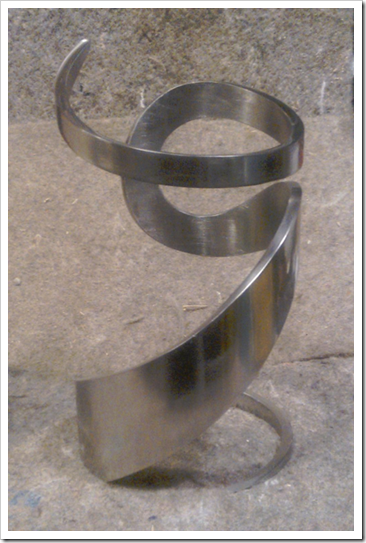 Grinding helped define the final shape and polishing gave it its final look. 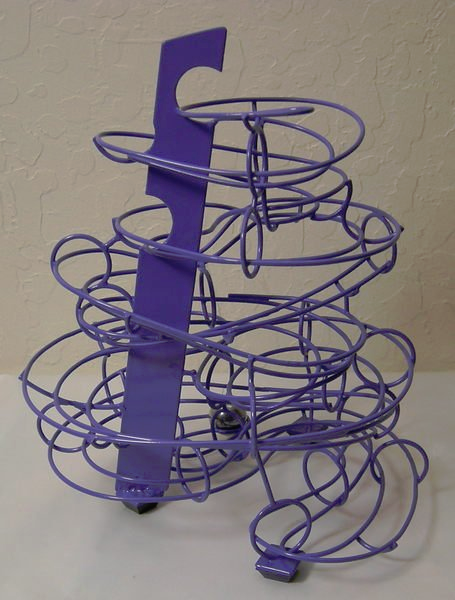 The only moving part of this rolling ball sculpture, sometimes called a marble run, kugelbahn, or other similar name, is the 1 inch steel ball. 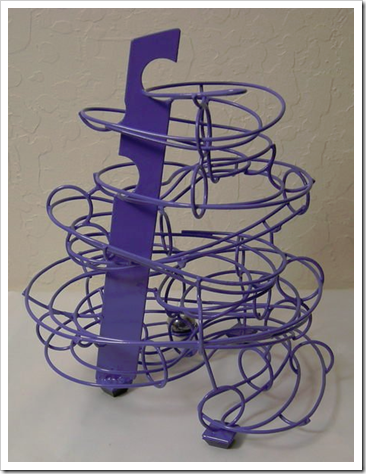 This relies on a viewer to pick up and place the ball at the top starting point. 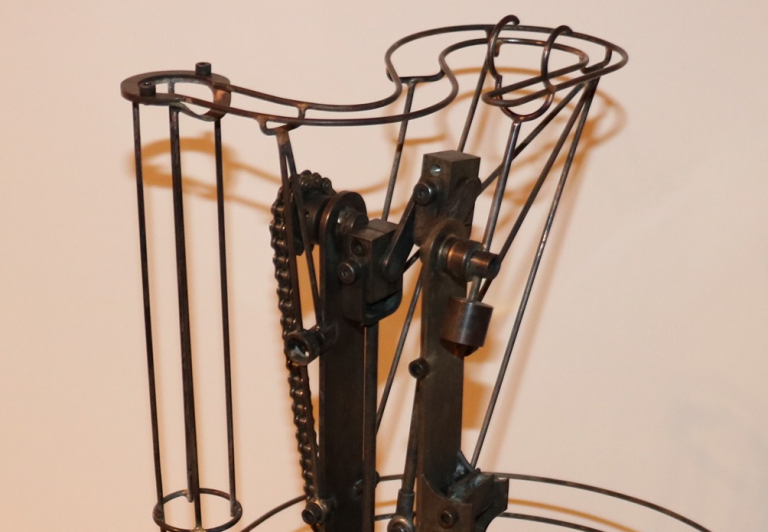 The one reversing mechanism is a simple gravity powered switch where the ball moved around a turn on an outside track which blends smoothly to an inside track. 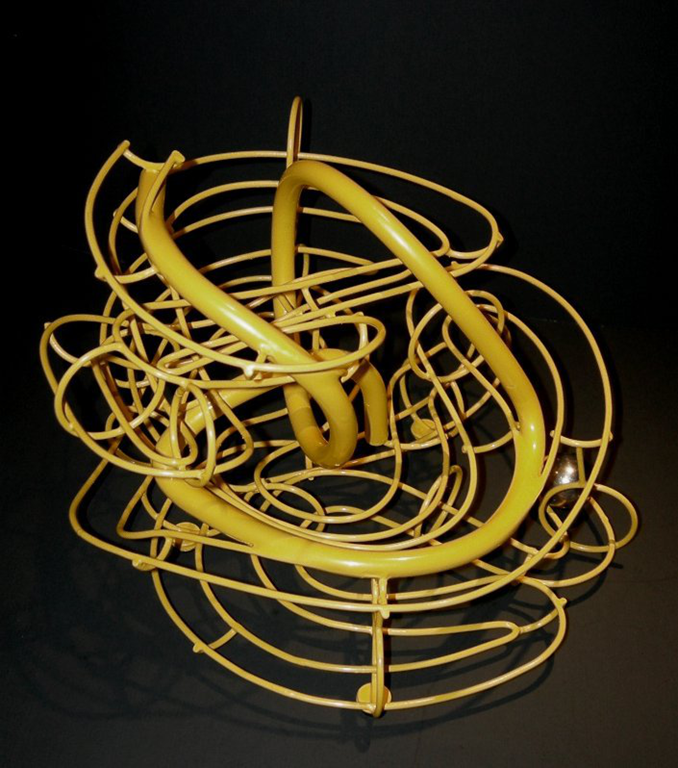 Once the ball reverses, there is not enough speed to get back onto the outside track and the ball follows the inside track to the bottom of the sculpture. This sculpture was intended to be plant-like and the terracotta colored base is intended to help with that interpretation. 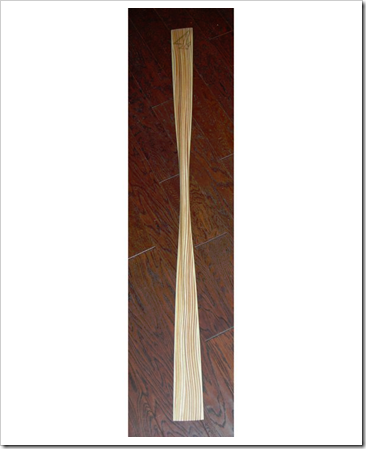 This Greenland storm paddle is a short paddle meant to be used with a sliding stroke. One hand will hold the blade with the other hand holding the loom, or center area of the paddle. After a stroke on one side, the the blade hand is slid onto the loop next to the other hand and then the other hand slides out onto the opposite blade for that next stroke. This paddle fits nicely on the front deck of the kayak. 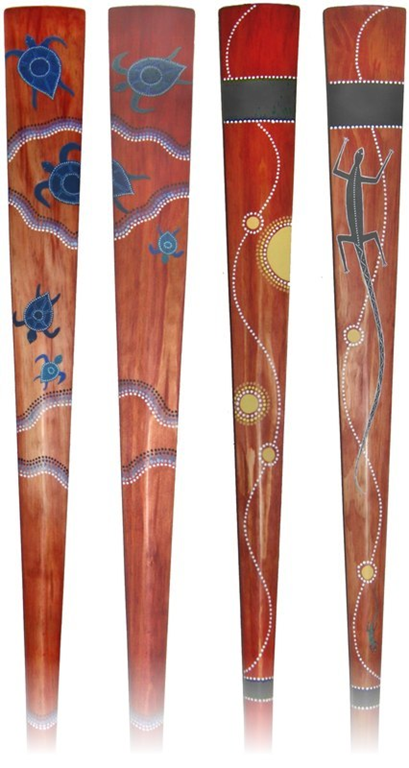 One thought about this style of paddle is that the effect of wind on the blades is reduced. This paddle was made from various thicknesses of wood stripes laminated together to form a slightly random or chaotic pattern. This was the fourth kayak paddle that I made from scratch. 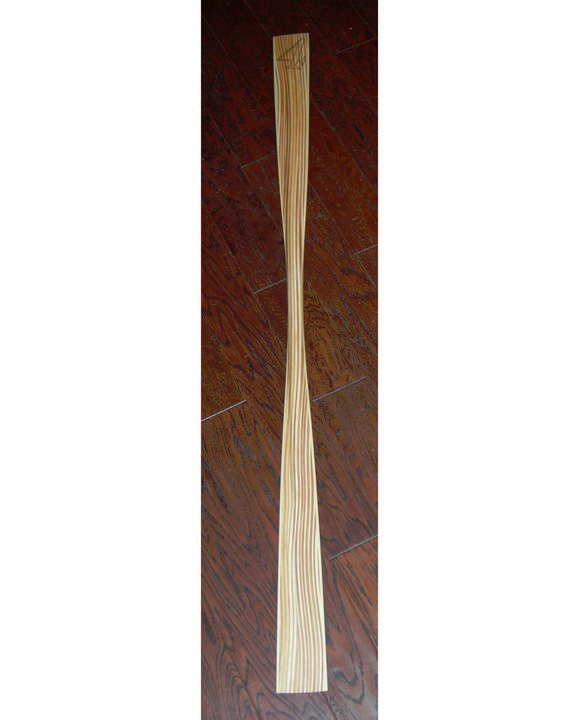 This Greenland style paddle is made from alternating color strips of wood. A form was used for the first few laminations to get the even wave pattern on the blade with a straight pattern along the loom or center of the paddle. The rounded ends of this paddle and the width of the blades makes it a close cousin of a Greenland paddle. It is not quite the traditional Greenland paddle which would have a narrower blade and less rounded ends. The extra width still fits my hand for when I need to do sliding strokes or use other Greenland techniques while still giving me a bit more blade in the water. 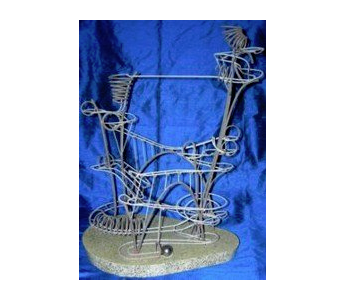 This earlier rolling ball sculpture features a “solid state” reversing mechanism like most of my rolling ball sculptures. Having the ball move along the track and then stop and proceed back the way it came is a feature that gets a lot of comments. 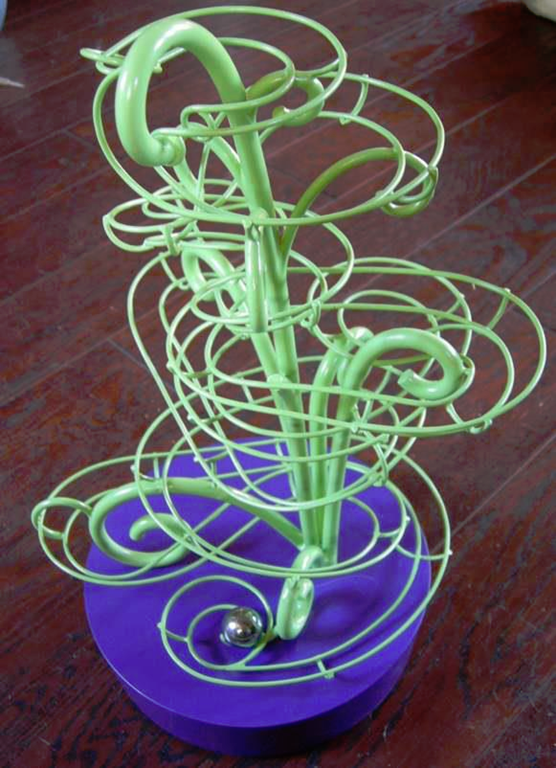 In keeping with my desire to use a different style on most rolling ball sculptures, this one features a steel bar spine running up through the entire piece. 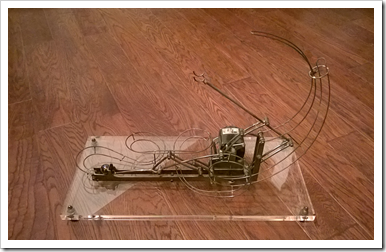 This early “piece of art” was a practice piece with my only intention being to weld up a small steel box from roughly 16ga material. 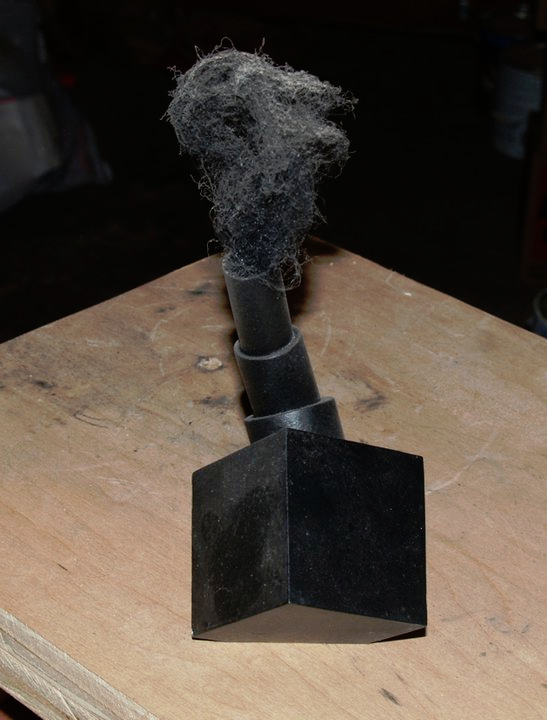 The dust is all natural and comes from this sitting in the garage through numerous kayak paddle and other woodworking projects. The pipes for the smoke stack are welded together on the inside of the pipe to give the steps in the stack a very sharp look. 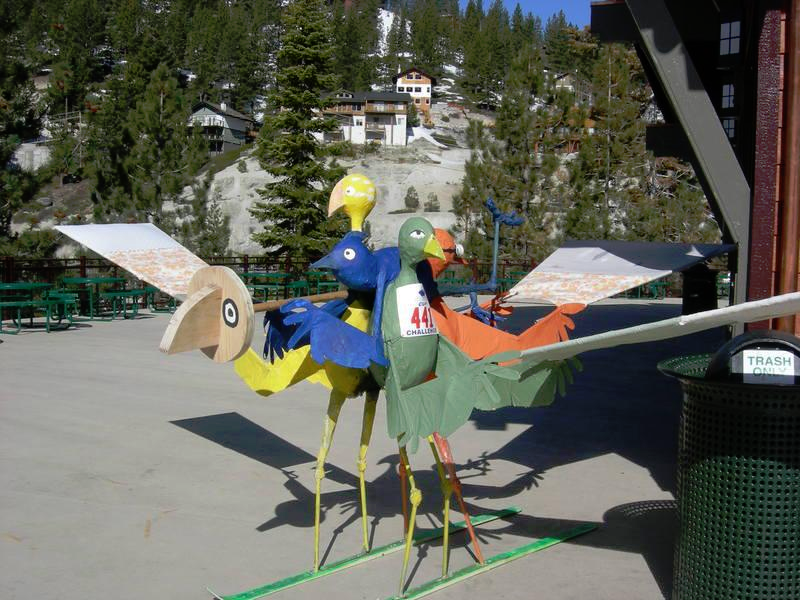 For on of the Dummy Downhill races at Diamond Peak Ski Resort in Incline Village NV, I build this “dummy” from parts of an earlier version. 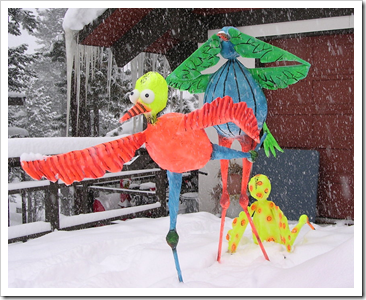 The four bird are riding on skis and having a tough time of it. The bird on the left is at the front of the dummy and is looking over his shoulder down the hill. 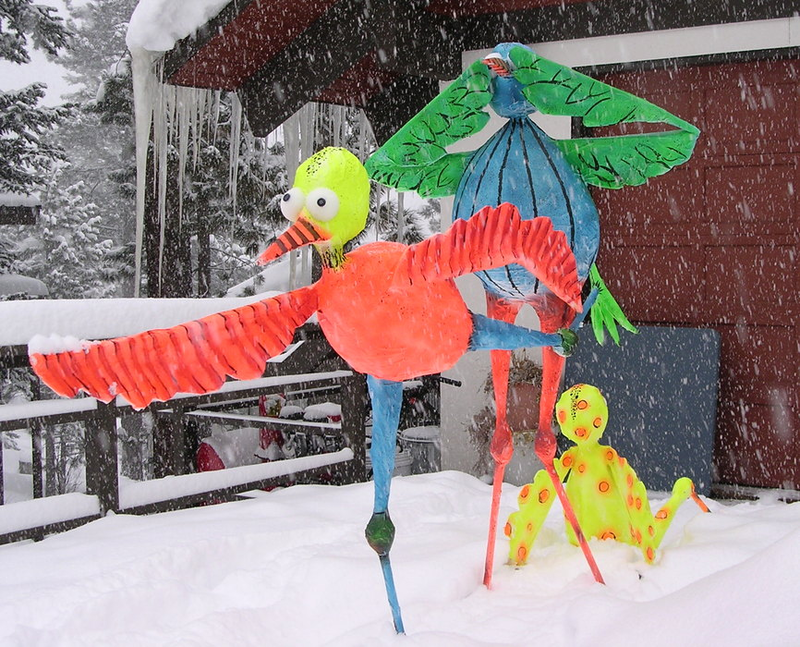 Aside from the goggles on these paper-mâché birds being cheap welding goggles and the skis being from the lost-and-found, the rest of the piece is made from scratch using solid conduit, expanding foam, and paper-mâché. 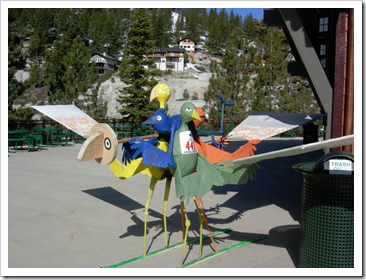 This was my second “Dummy” for the Dummy Downhill race at Diamond Peak Ski Resort in Incline Village NV. There are no pictures of the first one but it can be seen here by simply covering up the red bird and the yellow bird! 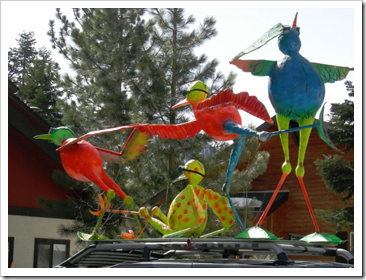 These are made from a framework of welded steel conduit, the non-flexible kind, and paper-mâché. 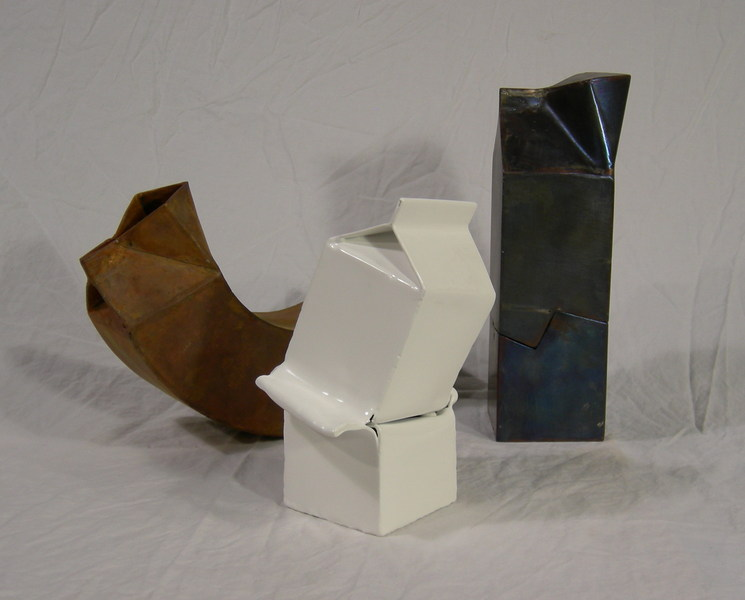 The milk jug project was a nice distraction from the one-per-semester piece being built in the TMCC welding for Art art class. These are all 16ga mild steel. 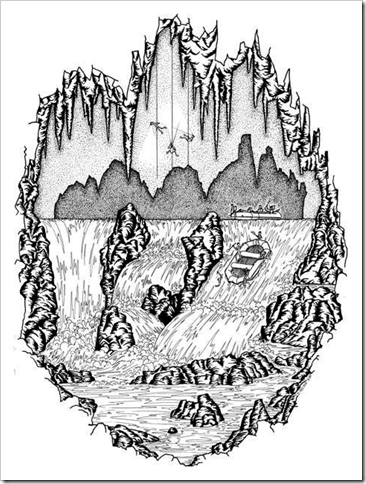 In the alternate view, the two parts of the dark jug can be more easily seen. The dark jug was heated to the highest possible temperature in my oven. The rust jug was rusted using a spray on rust agent. The white jug is painted. This solid pine kayak paddle was made from two layers of pine and was carved using hand and power tools. 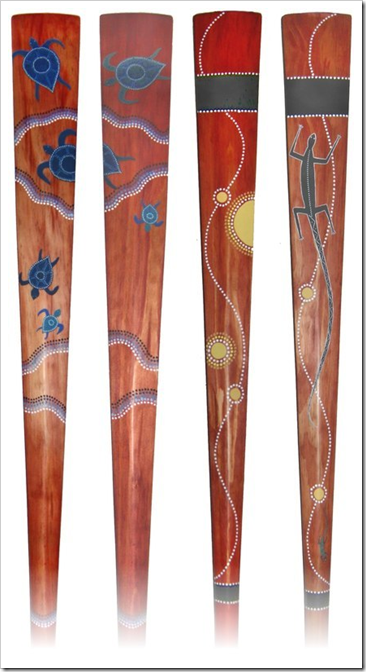 The artwork is an Australian aboriginal style not intended to fit with the Greenland origins of the paddle shape. This is one of my smallest rolling ball sculptures. It has no reversing curve like may newer pieces. 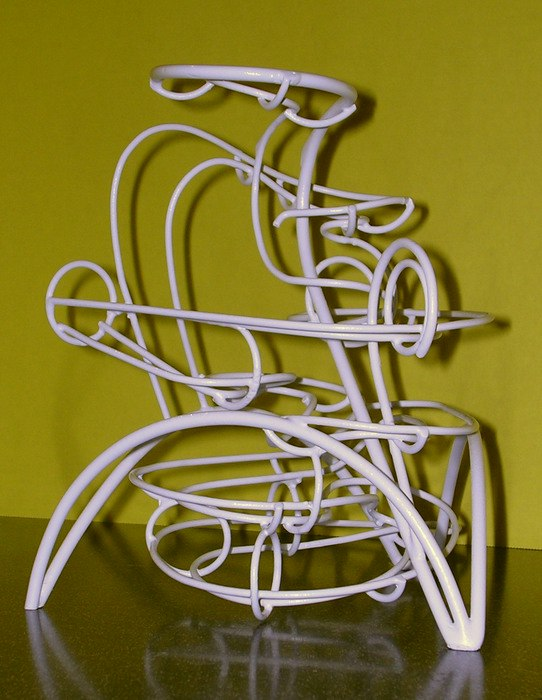 There are a few artistic shapes that appear to be track in this sculpture. 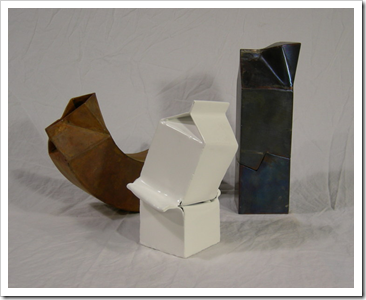 structural elements that become part of the track give this a more sculpted and artistic look. 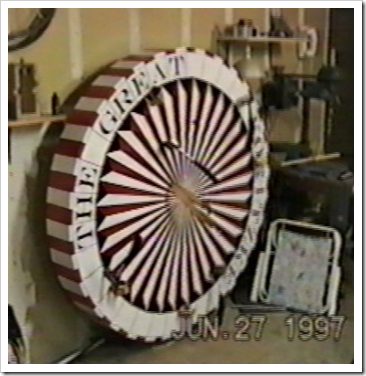 This large wheel was built for the Spooky House Halloween attraction in Los Angeles back when I was in that business. 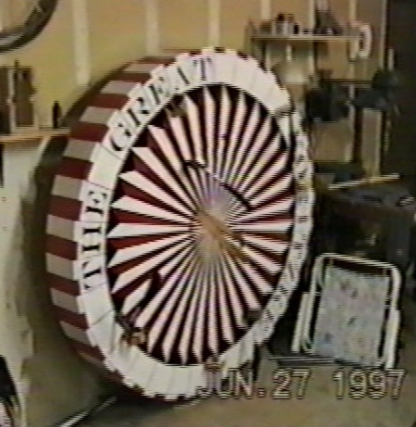 This wheel is about 5 feet around and is motorized. Hatchets can be seen stuck in it and later, a skeleton was strapped in as the hatchet throwing “victim.” This was part of a circus styled room in the haunted house. 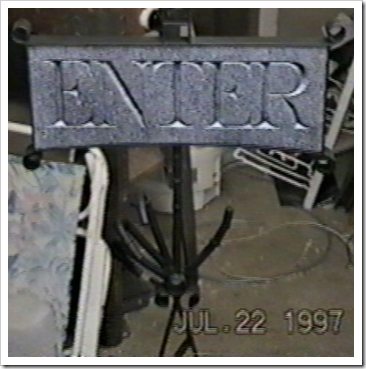 This entrance sign was built for the Spooky House Halloween attraction in Los Angeles back when I was in that business. 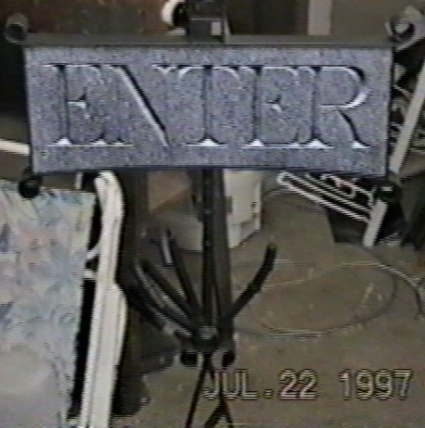 The sign post is roughly shaped like an arm with the skeleton hand on top holding a faux-stone enter sign. The lettering was hand carved in wood then speckled to give it the stone look. 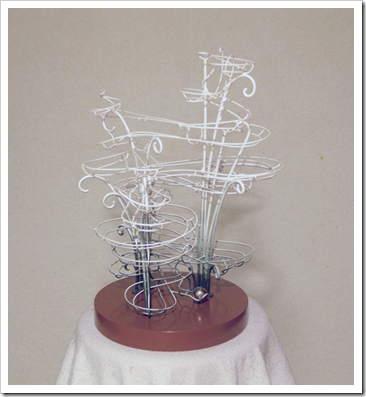 This early large rolling ball sculpture can be considered one of my early failures. I was too clever in giving the track a dip and once the paint was on, it often didn’t work right. It was not repairable and no longer exists. 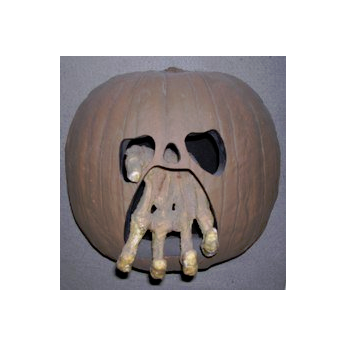 After a plaster pumpkin was made as a copy of a pumpkin from a carving contest (see below), this pumpkin was made from scratch and was not based on a real pumpkin. The hand is a welded steel skeleton covered in plaster then in latex. The shape of my own hand was used as a reference. 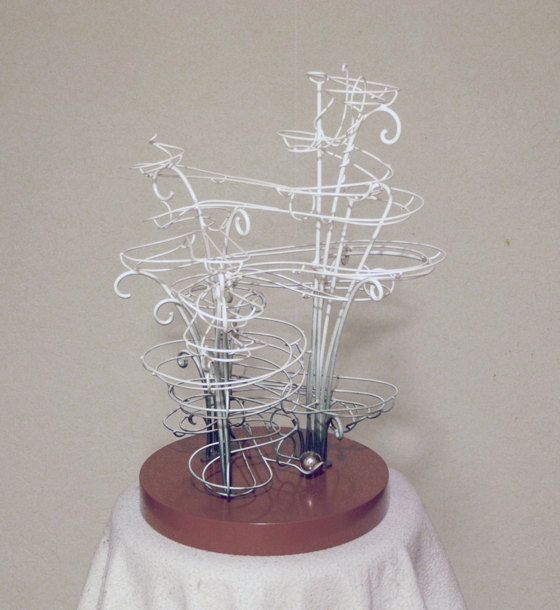 14” x 12” x 5” Plaster, Wood, Ping-Pong Balls, Steel Wire. 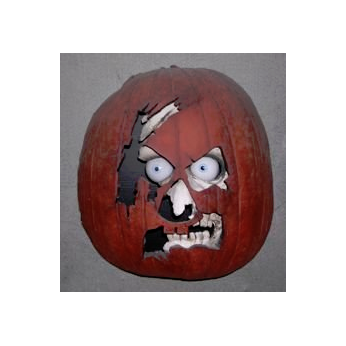 This plaster pumpkin was a copy of a real pumpkin that took first place in a company pumpkin carving contest. The contest pumpkin included a remote control for moving the eyes. 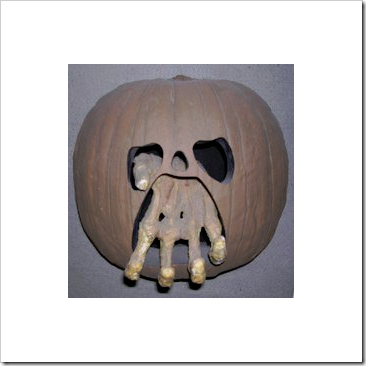 The inside face and eyes are the originals while a similar uncarved pumpkin was used to create the mold for the plaster version. This large wall hanging was based on a drawing in an early college art class. 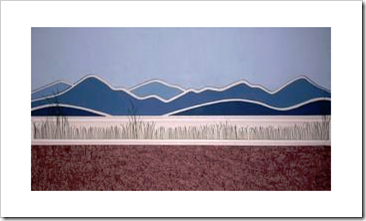 The mountains are all separately hung pieces and the grass is green wire in a wood frame. 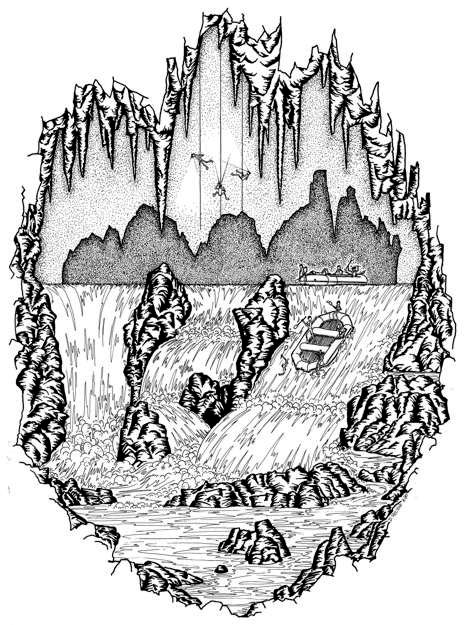 Raftunking is the combination of rafting and spelunking. Although we didn’t do both at the same time, this seemed like an appropriate T-Shirt design for a group trip. 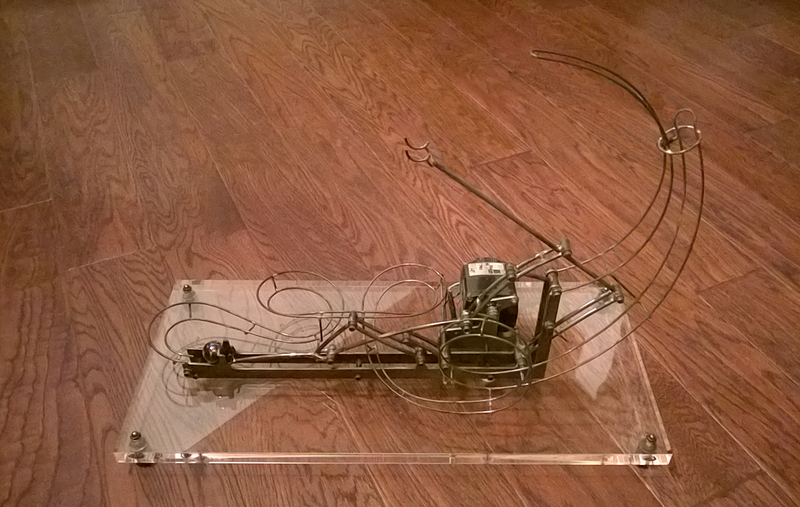 Using rail from a few off-the-shelf LGB rail switches, I built a Y switch and this homemade harp switch stand for it. 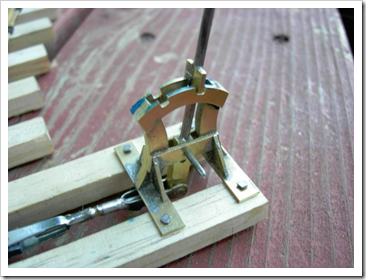 The switch stand is built from layers of brass sheet soldered into a unit. I took the photo a short time before cutting off the pivot rod. 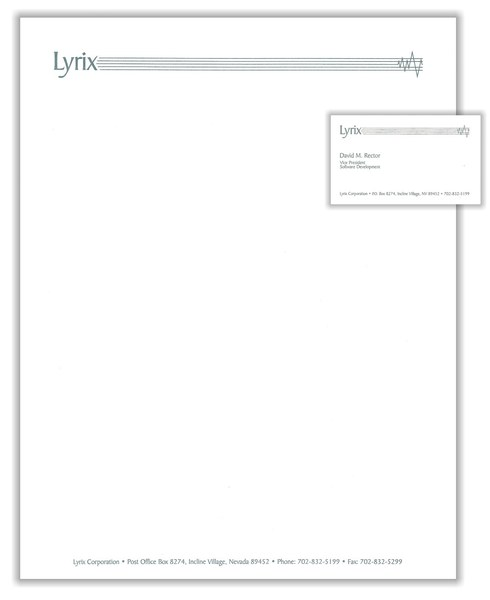 Lyrix built an audio preview system for record stores that a shopper could carry around and use a hand-held listening device. Any record bar code could be scanned to then hear a preview. 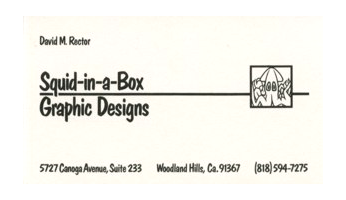 Back before computer programming became my career, I toyed with being some sort of artist.